It may be cold and dreary outside, but we’re still feeling the heat here at Agents of Field HQ, thanks to our bumper harvest of chillies! Ade’s just harvested the last of the three varieties he grew in the polytunnel this summer: Cherry Bomb, Bulgarian Carrot and Cayenne. Each variety yielded a large crop so we’ve had to store most of them. The easiest way to do this is to freeze them whole. I washed and dried them before spreading them out on a tray so they weren’t touching, and stuck them in the freezer for a couple of days. Once they were completely frozen, I popped them in a polythene bag. (Some people skip the freezing on a tray step, I just took this extra precaution so they definitely wouldn’t clump together.) I’ve now got a huge bagful in the freezer which will probably last us at least a year! I also made a batch of Sweet Chilli Jam at the weekend (which I’ve had a sneaky little taste of with some pork pie and it’s sublime!) so this is another good way to preserve them. What’s your favourite way of preserving chillies? Has anyone tried drying them? We freeze all sorts. I’ve also dehydrated them to make my own chili powder. Love ’em all! Homemade chilli powder, now there’s an idea! 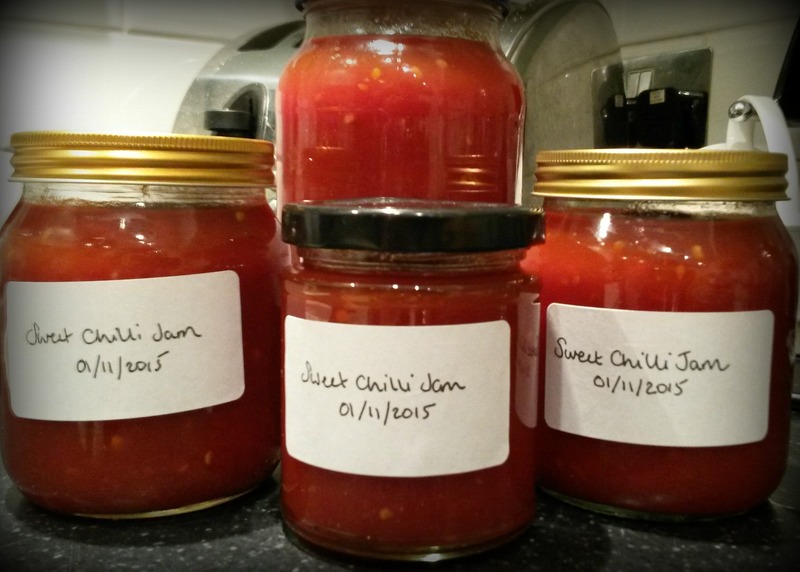 That chilli jam looks great and would make gorgeous gifts for family and friends. I’m getting ever closer to buying a pop-up greenhouse. That’s the plan! The chilli jam is a wonderful Christmas red, so there’ll definitely be jars of that going out to family this Christmas! It’s pretty easy – and super-yummy! Freezing is my favourite way as it makes them easy to pop into cooking and are easy to chop. Alternatively, I like to pickle them along with other garden veg to make a traditional Jamaican pickle or to turn into a hot sauce. I’ve never tried to make a chilli jam but I have eaten one and it’s lovely. Hi Lorraine, and welcome! I’ve been checking out your lovely Garden Hot Pepper Pickle on your blog, a great way to use up chillies, I’ll have to give that recipe a try next!